The Des Moines, Iowa start-up introduced a new way to make sending money easier – by tweeting it. 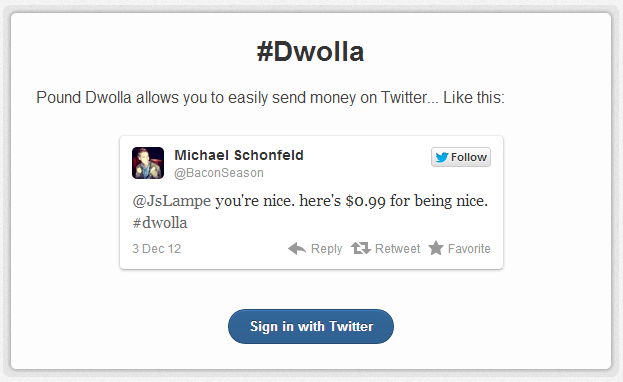 This feature ties a Twitter account to a Dwolla account, allowing users to send money with a tweet. Known as the weekend project, available at pound.dwollalabs.com, it is designed to demonstrate convenience and potential value of Dwolla‘s platform and its API. In order to send money, the sender needs to set up a connection between two accounts using the PIN code for the Dwolla account. The sender also needs to send a tweet with the amount to send, the hashtag #dwolla, and the Twitter handle of the recipient. The money is, then, deposited to the linked Dwolla account of the recipient. Another benefit to the Dwolla is the feature becomes an acquisition tool when non-Dwolla accounts are prompted to open an account in order to enjoy transferring money through tweeting. However, there are still questions on how secure Twitter is. If left open, a third party application might be used to access the account and could become a portal for an unauthorized user to tweet funds spontaneously.